How Do I Know When the License is Installed? How Do I Install The Licensed Edition? How Do I Install a Local nupkg File? How Do I Install The Trial Edition? How Do I Upgrade The Trial Edition? Exception of type 'Rhino.Licensing.LicenseNotFoundException' was thrown. ERROR: The term 'Install-ChocolateyWindowsService' is not recognized as the name of a cmdlet, function, script file, or operable program. Unable to load licensed version extensions and commands. Refer to How To Set Up Chocolatey For Organizational/Internal Use in tandem with this article. The email the license is sent to will automatically be subscribed to the customer advisory list. If there are other folks who need to be on that list for important notifications, please have them sign up at Chocolatey Customers. Please sign up for software announcements at Chocolatey Announce. Direct others to sign up for the list as well. For support, remember to use the support email address (below). Learn how to install below. Installation is also found at https://chocolatey.org/docs/installation-licensed. You will not see "Error when attempting to load chocolatey licensed assembly" warning message. If you do not see the edition next to the name and version without an error, you need to check over your installation procedure again to ensure you've completed it properly. See below. Here's the whole process for installing your license and installing the licensed code. NOTE: Prior to install, see if there are any parameters (like turning off context menus) that you may want to set. See install options. Install a recent version of Chocolatey (0.10.8+) - choco upgrade chocolatey (due to a tight integration, chocolatey.extension may need a newer version than what is listed here). TRIAL? You need to do more as your license key will not be known by the server. See Install the Trial Edition. You received a license file in email. Open PowerShell.exe as an administrative shell. You can type Windows Key + X + A (Windows 8+ - when that comes up if it is cmd.exe, simply type powershell to get into it). In PowerShell, run New-Item $env:ChocolateyInstall\license -Type Directory -Force - this creates the license directory. Alternatively, you can put the license in your user profile directory, e.g. "C:\Users\YourUserName\chocolatey.license.xml", however we only recommend you do this for Professional licenses as for other licensing you may need it to be recognized by multiple users. Verify the license file is set properly. In PowerShell, run type $env:ChocolateyInstall\license\chocolatey.license.xml. If that returns something, it means you are good to go. If not, something is misspelled or misplaced somewhere. Run this command: choco upgrade chocolatey.extension (or you can call install instead of upgrade). You will see an error you can safely ignore. Run this command: choco. You should not see any error message logged anymore (like you saw in the previous run asking you to install the licensed extension). If you do see an error message still, you may need to revisit these steps and determine what might have been missed or mistyped. NOTE: Also note that order is very important here. You need license file placed, then chocolatey.extension, then any other licensed components. Expect issues if you don't follow this order exactly. NOTE: Folks deploying the license out to many machines typically wrap the above logic into a Chocolatey package, embedding the license into the package. When they renew licenses, they just run an upgrade on the licensed package! Don't take a dependency on the chocolatey.extension package (Chocolatey Licensed Extension) as you need the license to be placed first to properly set everything when you install the licensed extension. Refer to How To Set Up Chocolatey For Organizational/Internal Use where not only is this covered, but we have a script you can run that will create the license package automagically. If you've received a trial license, you will also receive a link to download a recent version of the chocolatey.extension package. You will not be able to install or upgrade the licensed edition through regular means. Chocolatey may add the licensed source, but your license will not be recognized on the server. Install a recent version of Chocolatey (0.10.8+) - choco upgrade chocolatey (due to a tight integration, chocolatey.extension may need a newer version than what is listed here). You received a license file in email. That email also contains links to download licensed nupkgs. If you received the license file from another party but not the email, please ask them to forward it over to you as you will need it. Obtain the chocolatey.license.xml and download the licensed nupkgs from the locations noted in the trial license email to a local folder. Note this location, you will need it later. Run this command: choco upgrade chocolatey.extension --pre --source c:\folder\where\downloaded\nupkg\resides (or you can use install instead of upgrade). Note: Source location is not --source c:\downloads\chocolatey.extension.1.8.1.nupkg, it is --source c:\downloads. You will see an error you can safely ignore. See the difference between the trial install here and a fully licensed edition (also see the pictures above). In the trial, package authoring features have nag warnings that require someone to manually hit the Enter key a random number of times. Do not attempt to automate Package Internalizer / Package Builder or choco sync when using a trial of C4B. Execute those things directly and see how well they work for you. There are no trial type messages for runtime features unless they need to use Package Builder (like choco sync does), which should allow you to test those features with other integration tools. As of Chocolatey Licensed Extension v1.12.2, you can install to client machines without the context menus (Right Click). Add the following to your installation : --params="'/NoContextMenu'". Currently there isn't a way to remove context menus if you have already deployed them, but it is on the backlog to add that. Example: choco install chocolatey.extension -y --params="'/NoContextMenu'". Your license automatically adds the licensed source. NOTE: If your license expires or you remove licensing and then run choco, it may remove all of your licensed configuration settings, so be prepared to add those settings again once you have a valid license. You will not be able to upgrade through regular means - please reach back out to the Chocolatey Software folks to get an updated edition (and possibly an extended trial license). Once you have the license down and the licensed edition extension intstalled the first time, you will have access to choco download. This will allow you to download the licensed edition and put it on your internally hosted repository. Whatever followup command you need to push that downloaded package to your internal package repository. You can even script this or add it to a CI job that would automatically make the newer edition available. Most organizations using Chocolatey and Puppet are going to do so with zero internet access. ## the password is your license GUID. For C4B (Chocolatey for Business) customers, there is an optional agent service you can install. The agent service allows for things like background mode, setting up maintenance windows (future), and hooking up to Chocolatey Central Management (future). For more on the agent service, please see Agent Service. This is used in conjunction with the script in Set Up Licensed Edition With Puppet. When you are attempting to install the licensed edition, you may run into some errors depending on your configuration. Here are some common ones we've seen. You should see the output of the license file. If you do not see this, the license file is not placed correctly or misnamed. Please go back and set the license correctly to see if that fixes the issue. Open a support ticket and send us the log and the output of the commands in this step. If you run into this error, it means you are on an older version of Chocolatey and you need to upgrade. Set the license file back and proceed with the install or upgrade process as above. You can get this if you are attempting to install the chocolatey-agent package, but you don't have a verified installation of a licensed edition of Chocolatey. You must resolve that prior to attempting to install the chocolatey-agent package. See How Do I Know When the License is Installed?. You may see a message like this: Unable to load licensed version extensions and commands. Please make sure the version of Chocolatey you are on is up to date and meets the minimum requirements of the licensed version. If that version is in beta, that means the latest avaialble version. followed by the actual error that may look something like this: Could not load type 'chocolatey.infrastructure.app.services.Isomething' from assembly 'choco, Version=0.10.7.0, Culture=neutral, PublicKeyToken=79d02ea9cad655eb'. 0.10.7. If you see this, it is typically due to an incompatibility between Chocolatey and the licensed extension (Chocolatey.Extension). As these two are tightly integrated to each other, sometimes there are incompatibilities introduced. Chocolatey Software will inform customers of these issues and ways to get around that, typically ahead of releases on the customer advisory list (the link for this is sent with the email that contained the license). If that is successful, you are good to go. If not, check for other processes locking files/folders in your Chocolatey installation. Please see Access to the path is denied. NOTE: Running choco in an unlicensed sense will reset/remove all licensed configuration. Make a backup of the chocolatey.config (typically at "C:\ProgramData\chocolatey\config\chocolatey.config"). 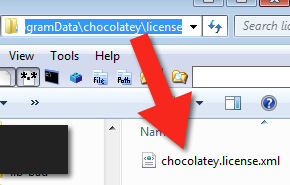 Remove the license file - rename the license folder to licensed (typically at "C:\ProgramData\chocolatey\license"). In the extensions folder, delete the chocolatey folder (typically at "C:\ProgramData\chocolatey\extensions\chocolatey"). Add the license file again - rename the licensed folder back to license. Compare the current chocolatey.config to your backed upchocolatey.config` and set anything that was reset in this process. You may see Error when registering components for 'chocolatey.licensed.infrastructure.app.registration.ContainerBinding': Exception has been thrown by the target of an invocation. This falls into the incompatibility or locking aspect. Please see Unable to load licensed version extensions and commands. You may be attempting to upgrade chocolatey.extension and see that the access to the path c:\programdata\chocolatey\lib\chocolatey.extension is denied. If you've verified you are an administrator and can not get into that folder, it's likely the folder was attempted to be deleted, but another process was accessing that folder and is holding a lock on it. You can use Handles (SysInternals) or something like LockHunter to attempt to find out if there is a lock on the folder. If there is, you normally would just need to close the process in question so the folder can be deleted. Unfortunately, this is likely to cause your install to be unusable until you fix the locking issue. In the Windows 10 1803, it may remove the file association. You can simply choco install chocolatey.extension -y --force to add it back in.